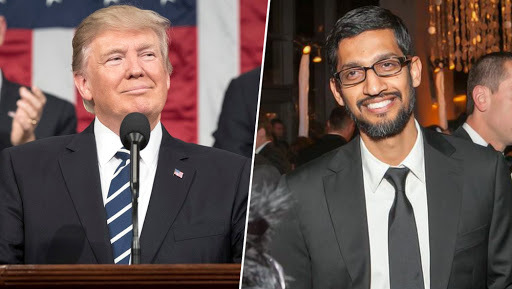 San Francisco, March 28: Giving more fodder for fun on social media, US President Donald Trump addressed Sundar Pichai on Twitter as "President of Google" after meeting him to discuss issues surrounding its dealings with China and "political fairness". Pichai is Chief Executive Officer (CEO) of Google. Trump Says Google CEO Committed to US, Not Chinese Military. "...Also discussed political fairness and various things that @Google can do for our Country. Meeting ended very well," he tweeted. Google Stadia is New Cloud Gaming Service From Google Unveiled At 2019 Game Developers Conference. After media reported the error, Trump hit out at the "fake news". "The Fake News was disparagingly all over this and it became yet another bad Trump story," he tweeted. Trump again lashed out at the media on Thursday, saying, "The Fake News Media is going Crazy".